It must be by some prescient force of Russian magic that Sergei Maliutin and Vasiliy Zvezdochkin created Russian nesting dolls. How else would they have been able to know that over 100 years later, the toy would be discovered to be an actual tool? Whether you call them nesting dolls or matrioshka, matryoshka, babushka dolls, or stacking dolls, the fact remains: they accurately act as measuring cups. 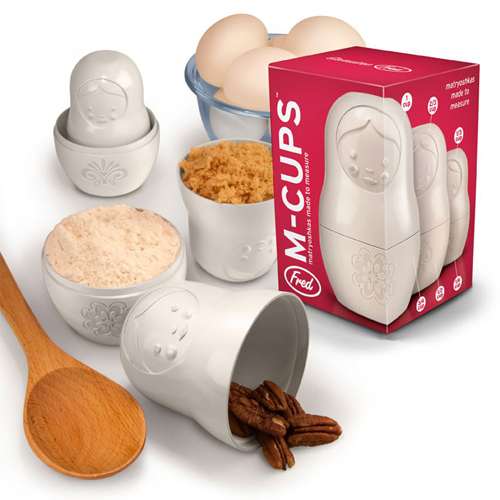 Okay, so well, you need the M-Cups from Fred & Friends to actually use the nesting dolls as measuring cups, but the fact remains that this set is just as home in the kitchen as it is on the tchotchke shelf. At least in the case of this set, they accurately measure 1/4, 1/3, 1/2, 2/3, 3/4 and 1 full cup. How? We may never know. Like how the moon can be just the right size to cause the occasional perfect solar eclipse, some things may never well be answered.